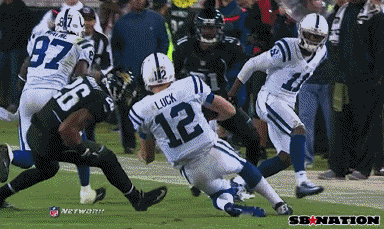 Week 10 NFL Fines: #Jaguars Safety Dawan Landry was fined $10,000 for a late hit against the #Colts. Week 10 NFL Fines: #Jaguars DL Terrance Knighton was fined $25,000 for a late hit against the #Colts. Knighton's 25k is a joke, wasn't targeting, wasn't malicious. The fines are fine. The rules are the rules. They want to promote player safety. We're both plays flagged? I don't remember the Landry penalty. Mularkey said the refs made incorrect calls on (I believe) Blackmon and Brewster's blocks that were flagged in the game. Yeah. Knighton for going Helmet to Helmet with Luck on the interception, and Landry for going shoulder to shoulder with Luck as he was sliding after a scramble. Knighton's is the standard H2H fine, Landry's the standard for a clean, non-malicious late hit. I just don't understand why you would fine someone for a non malicious hit. The penalty was enough. The fine is unnecessary. Player safety. Penalties didn't deter them from not making correct form tackles, which is the root cause of the injuries. They're hoping that the fines will. 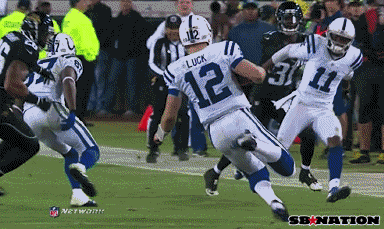 Luck's body is already suggesting that he is getting ready to give himself up. From this point, Landry does a little hop with both feet to get himself in position to make the hit. 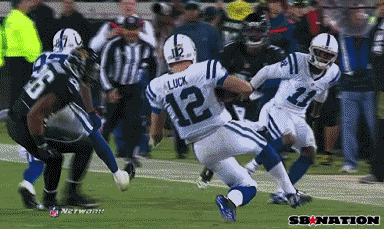 Luck is quite clearly sliding at that point, and Landry has yet to push himself into making the hit. At this point, Landry is expected to stop pursuing the ball carrier for a big hit. 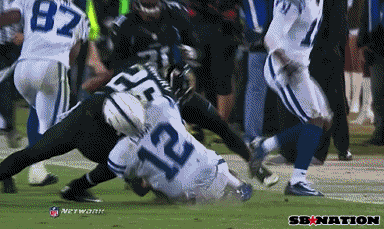 He then continues through on the hit, hitting his arm/side/shoulder into Luck's shoulder/chest area. That's a fine every time it happens. I just don't see Knighton's hit as being that big of a deal. I am starting to lean more towards basketball. This NFL season has been nothing short of horrible. A bunch of pansies. Okay my rant is over. I tell you I respect the Jags forum nothing but classy posters. They got a good group over there.